Distilled Water – Self Fill Water – Bring in your container, or purchase one of the refillable bottles available at the store. Superior Purified Water Produced by Steam Vapor Distillation Many people choose distilled water as it is considered completely free of impurities, the purest form. Bring in your container, or purchase one of the refillable bottles available at the store. Assuring that Every Gallon is at it’s Purest, Everytime! Our Water Is Made Fresh! Stored In Stainless Steel Tanks! Your bottle is Filled in Front of Your Eyes! 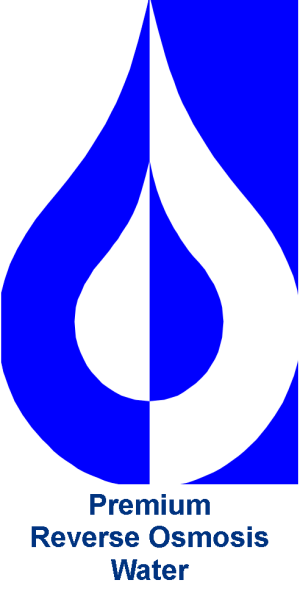 Many people choose distilled water as it is considered completely free of impurities, the purest form. We take our Reverse Osmosis Water and process it through a Steam Condenser System. Steam Distilled Water is produced by a completely natural process, simple heating and cooling, exactly like earth’s natural rain process, resulting in a product with completely natural qualities. The result is pure, clean, naturally healthy water. Note: The steam distillation process takes aprox 2.5 hours for each 5 gallons of water produced. Please be aware – we make our water fresh daily, and because the process to make 5 gallons of water is long – we often sell out of steam distilled water, especially on Saturdays and holiday weekends. Please come for water during the week to insure a supply. Please Note: we do not deliver, we do not accept bottle deposits, or bottle returns. Our bodies use water strictly for two purposes: hydration and cleansing. The water we offer are the only waters that naturally and efficiently achieve both! Reasons Why Polar Bear’s Water… is the Preferred Water Choice! Our Water—contains none of the contaminants of normal drinking water. 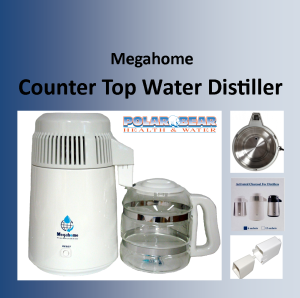 You will notice an improvement in taste, not only in the pure water you drink – but also in cooking, drinking, tea, coffee, juices, ice cubes, home brew wine and beer kits. 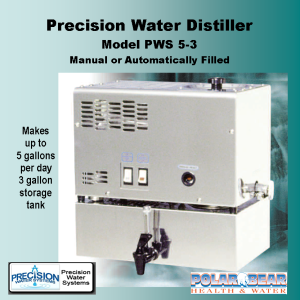 High Purity—water from which virtually all types of unwanted contamination have been removed. This includes organic chemicals (such as chlorine, TCE, pesticides, and all other carbon-based materials), inorganic salts (such as sodium, metals, lime, nitrates), radioactive materials and biological growths such as bacteria. Carbon filtration... for chemical removal. Ultra Violet lights… for sterilization, just before our water enters you bottle, this ensures the water you receive is bacteria and virus free. Bottle Wash…you also have a choice to wash and sanitize the inside of your bottles. Stainless Steel Tanks—we are one of the few, who has invested in stainless steel water storage tanks. This insures you receive the highest quality water, verses others using plastic storage. Fresh Water! – Made and sold fresh daily. Not pre-bottled—but bottled right in front of your eyes—which ensures freshness with every fill. The Purest Water Possible—It is evident that we require sufficient amounts of water to maintain the health and vitality of our bodies. However, in order to derive the greatest benefits from the water we consume, it is important that we drink “The Purest Water possible.” At Polar Bear Health & Water, we strive to provide high quality, healthy products. The highest quality purified drinking water and a range of water accessories, water coolers, porcelain crocks, bottles, shower filters. We also offer vitamins, supplements and specialty foods.